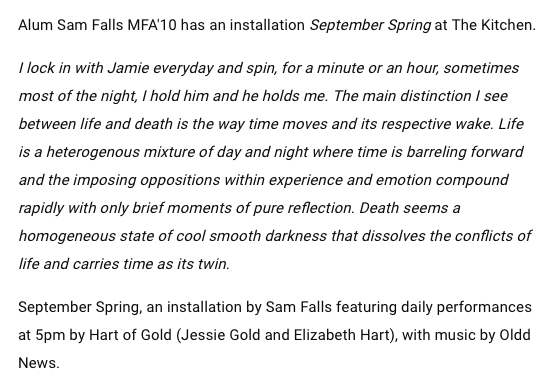 Wednesday, Septmeber 9th, 6pm-8pm, at The Kitchen in Chelsea, September Spring, an art installation by Sam Falls opens. Daily performances by Hart of Gold and music by Jamie's old band, Oldd News, will take place through October 3rd. The Kitchen is an internationally famous non-profit performance/multi-disciplinary art space where many artists of the American avant-garde have cultivated their vision. Artists hailing from the Kitchen include Phillip Glass, Laurie Anderson, Talking Heads, Young Jean Lee, among many others you either have or should have heard of. The event itself is free, but all donations go to the Jamie Kanzler Foundation.